Hello everyone and hello winter - how cold is it at the moment .. BRRRR! I am excited to be putting another 'IN HER SNEAKERS' up on the blog! I actually love receiving the responses from the girls, I often sit reading through with a stupid grin on my face. It's incredible the things that a lot of these gorgeous girls are doing. I find it so inspiring to read through them and can so relate to so many things. It's so comforting to see that everyone has struggles, and a lot that are very similar to the ones that both you and I have as well. It's also super cool to find people that are on the same journey as you and who have the same interests. It definitely makes me feel like I'm not alone and I hope it helps others too! Social media is amazing sometimes, it enables us to make connections with people that you probably wouldn't have met or known of otherwise. My name is Nina, I’m 19 years old and from Wellington, but currently study commerce up at the University of Auckland. I have a part time job at a wholefoods store and love all things health, food and fitness. I co-run the Instagram account @feedingfitfoodies with Jessie (who I met up here at the halls last year) which is where lots of this is documented! To me, health is being balanced in all areas of life – making sure I’m getting enough sleep, eating well, moving my body most days in a way that I enjoy, spending time with friends and family, dedicating some time to study, and having some time to myself to chill too! Sounds super overwhelming listing it all out here, but feels amaze when you know you’re giving it your best shot! I normally get up and exercise first thing, whether it’s a run, gym sesh or workout at home, although I’m not super fussed as to when I exercise and often end up doing it afternoon/evening too! I’ll have breakfast, and if I know I’m going to be in a rush I’ll have something already prepped like overnight oats. I live really close to uni so I kinda just go in for a lecture and then pop home which works nicely for me as I can come back and study from the comfort of home! I can procrastinate quite a bit – whether that’s scrolling through Insta or deciding to completely clean my room – but most days I have a few tasks set that I want to achieve and they pretty much always get done!! I’ll always be having breakfast, lunch and dinner – I’m not one of those people who can forget to eat!! I’m quite a snacker too – especially when studying... I love hummus + carrot, apples, dates + nut butter, edamame beans or avo on toast. Breakfast go-tos are smoothie bowls, muesli or oats – I have quite a sweet tooth! Lunch I often have leftovers from the night before or something that’s quick and easy to whip up so I can keep getting on with my day. For dinner I love roast veges or getting creative with different salad combos, I’ll always do stir fries a couple of times a week too to use up anything that’s left lying in the fridge. I hate wasting stuff (student life ya know) so near the end of the week my meals get kind of interesting/creative trying to use up what I’ve got! Most nights I’ll have a peppermint tea before bed too. I love going to the markets on a Sunday to stock up on fresh fruit + veges, as well as a supermarket shop and a few hours prepping food - I find this sets me up well for the week ahead and I really enjoy it too. I love working out with a friend – it’s so enjoyable to have company, to plan what you’re doing together, and it also commits you to the workout - otherwise you’d be letting your mate down! I’ve also learnt just to do what works best for me and not get too caught up with what others are thinking or doing or eating or saying – you do you girl! I love a good list!! I always jot things down on my phone notes and find I can sleep way easier at night if I just write down everything that’s on my mind so I don’t keep myself awake thinking about everything and anything I have to do! I use a weekly planner to plan out my whole week day by day, as well as a wall planner so I can always see upcoming deadlines and exam dates (they loom over me at my desk haha). Taking rest days. I like to get into a rhythm and momentum with my training and hate taking days off! I always end up paying for it though – sore aching body calls for a heap of Epsom salt baths! “Consistency is key” from my first rowing coach. This was in the context of our rowing training and being consistent throughout our training pieces, however I think it applies heaps in many areas of life. Sure you might have a big night out, take a day (or week) off training or indulge in a bit too much choc, but it’s what you do the majority of the time that really counts. What a great question! I love raw choc like pana (sour cherry + vanilla or mint) or the loving earth ones! I’m also such a sucker for caramel flavoured things and love raw slices or nut butter + dates! I love running, HIIT and weights and find myself doing this most of the time! Double points if outside, perfect weather or with a friend! 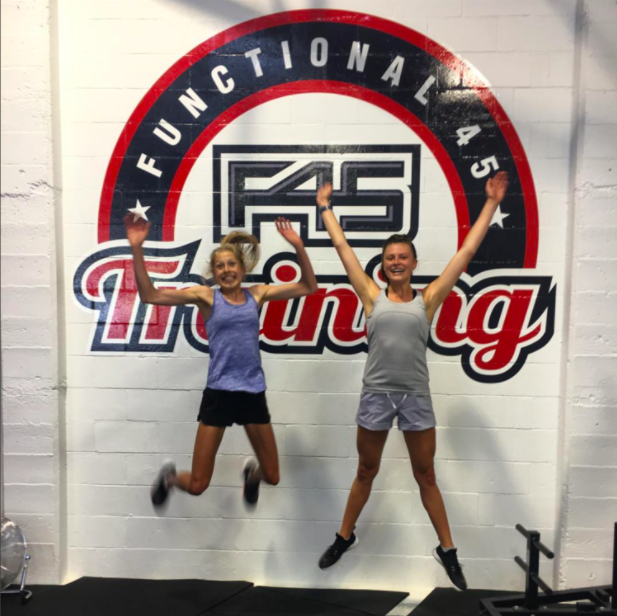 I love changing it up and trying new things too – like F45, barre, yoga and pilates! So typical but eat your greens and keep hydrated – you’ll never see me without my water bottle and I try sneak greens into everything! Doing both of these always makes me feel my best! These girls are amazing and the food they create is unreal! I mean check out those pancakes above! Thanks so much to the lovely Nina for being a part of IN HER SNEAKERS, you'll find Nina @feedingfitfoodies ! Follow them for daily food and fitness inspo!